Since several years ago, the new generations of fashion design have known how to adopt and transform some of the keys of past eras as a way to fight against the current production models. In this way, the artisanal has become one of the basis of slow fashion, a movement that is aware of the value of sustainability, dedication and ethics. As a union between the past and the future, slow fashion will be the focus of the runway show #Identity/Alta Costura 2019 of the Haute Couture fashion firm YolanCris, an event in which ESDi student Patricia Mestres and Martin Morante will participate with a design project of their own. The gathering, to be held on April 26th (20:30 hours) in the Maria Cristina avenue, will be a platform for distinguished artisans who want to develop synergies with up and coming designers. This way, students from different design schools will have the chance to present their own creations in the “Village” sector of the event, which will include gastronomic proposals. Mestres and Morante, who will represent ESDi in the event, will exhibit a piece articulated according to the concept of essay, incompletion, constituted by a skirt and a shirt done with nonwoven fabric given by the brand. 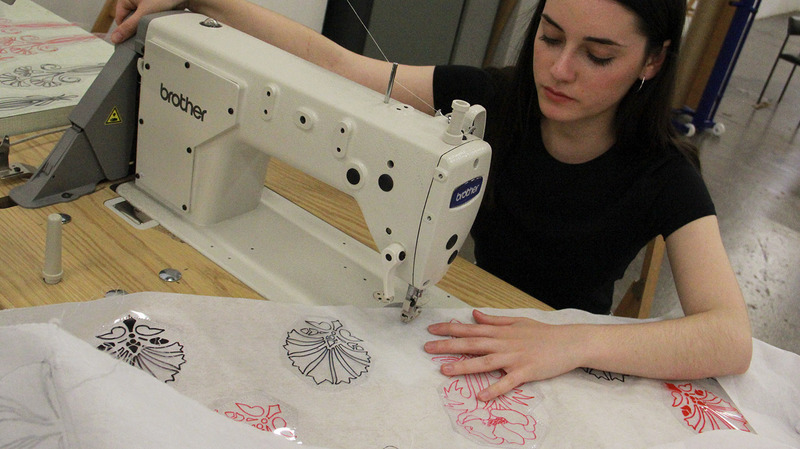 Moreover, the young designers will integrate accessories based on prototype-style embroideries. The event will also include the participation of La Fura dels Baus, group that will turn YolanCris’ runway into a performative event, artisans that will exhibit their projects, creations by the artist Pi Piquer and interventions by La Veronal, one of the most important dance companies in the country.